This project builds on the research of Professor Cassandra Pybus into a distinct cohort in the Book of Negroes who are all Methodists from Tidewater Virginia. Whereas Pybus's earlier research in her book Epic Journeys of Freedom, read the Book of Negroes forward beyond the American Revolution and into the history of other British colonies, this research traced individuals by reading backwards into the archives of the pre-revolutionary Virginia. It revealed a web of interconnection that indicated unexpected patterns of slave family formation and kin networks. The complexity of the many interconnections required the development of a network visiualisation that could provide an effective interpretative tool for the mass of complex and fragmentary data. 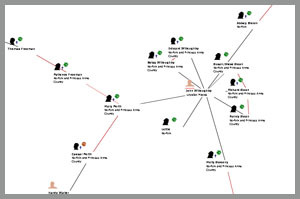 The prototype network visualisation of the Black Methodists can be viewed here. ©Copyright 2009 University of Sydney. Site designed and developed by Sprout Labs. For more information contact Cassandra Pybus.